Innovation and high quality is the key to the success of Kettler exercise bikes. They are recognized worldwide as representing a brand that symbolizes quality, style and durability. Kettler was founded in 1949 by Heinz Kettler in his hometown of Ense-Parsit, Germany. The company has grown to be a leading brand of home fitness equipment, toys, and leisure furniture, with manufacturing sites throughout Germany and its subsidiaries worldwide. The Kettler USA Division celebrates its 30th year in 2011. The company is still owned by the same family. The Kettler HKS Polo M upright exercise bike ($549) offers silent magnetic resistance with infinitely variable resistance (indexed to a range of 1-10), an LCD display console, and multi-position handlebars. Downside: it is not adjustable for shorter users to enable them to comfortably reach the pedals. The Kettler X1 Ergometer ($999) is an upright exercise bike with an adaptable training computer, 25-400 watts resistance range, adjustable gel saddle and seat post, multi-position handlebars, and more. 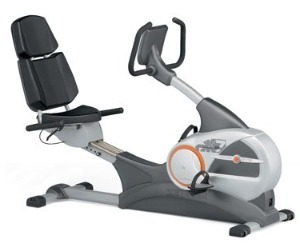 The Kettler RE7 is a commercial grade recumbent exercise bike ($2,299) with better biomechanics for working the lower body correctly and comfortably, a low center step for easy access, bike-brake style release lever for easy adjustment while remaining seated, 3-year warranty on parts, and one year on labor. The Kettler Race ($1,499) is an indoor cycling bike designed for people who take spinning seriously. It features a 39-pound flywheel that builds speed just like an outdoor bike, a friction-free magnetic braking system, fully adjustable handlebars, combi-clip SPD pedals, an adjustable racing saddle, and much more. Some of the other models include the Racer 7 and 9, the Golf R and P, The Tour 7, Speed 5, Giro GT, R and S, and the Axos. As you would expect, reviews on this brand are above average. Kettler exercise bikes are very durable and give the user years of pleasure and challenging workouts. The Kettler Group continues to come out with some of the best-engineered designs in the industry and set the bar high for quality and workmanship. Kettler HKS Polo M - Lightweight and portable, very well made, has the durability of a bike costing twice as much; very quiet and smooth for a home model. 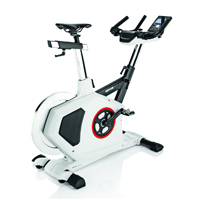 Kettler Race Indoor Training Bike - A well-engineered quality bike which offers a very different look from other Spinner-type bikes on the market. Kettler X1 Upright Bike - A strong choice for a durable cardio trainer; you get quality components and ergonomic features – not frills, graphics, and programs you don’t need. Kettler EX3 Upright Bike - This exercise bike gives the user a comfortable upright posture and a good-size 22-lb flywheel for a superior workout session; a good indoor cycle with a solid warranty. Kettler RX7 Recumbent Bike - The comfortable RX7 can be used by senior citizens or people in injury rehab. Unique brake system offers extensive range of variable, frictionless electromagnetic resistance.